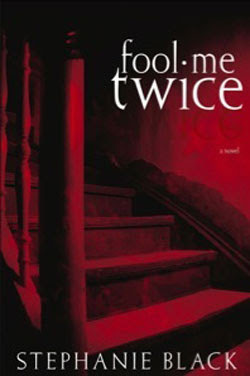 Fool Me Twice by Stephanie Black was a suspenseful ride. Megan and Kristen are twin sisters. Megan is the nice, compassionate one, and Kristen is the greedy, self-centered one. Megan takes care of her needy widowed-mother, putting off college while working two jobs. Kristen stays as far away from them as she seeks the easy way out of things. Megan, eager to please her sister, agrees to a scheme that Kristen arranged as a way to easy money. All Megan has to do is pretend to be Kristen and take care of a long-lost great-aunt that is on her dying bed. Kristen tells Megan that Aunt Evelyn will leave her money when she dies. Reluctantly and uneasily, Megan agrees to Kristen's scheme. Soon, she finds that some of what Kristen told her is untrue, but maybe even Kristen doesn't know the whole truth. Many people are lying and their purposes are hidden. I really liked this book, finding out new details at every turn of the page. It was suspenseful and interesting to find out who was doing what and why. I recommend this book if you want a fun, suspenseful read. Heh. whoever entered it at Amazon put the author in as "Stephanice Black". i'm surprised their spel-chekker didn't catch it.